Ongoing preclinical investigations and clinical trials involving new targeted therapies promise to improve survival in patients with lung cancer. Targeted therapeutic agents based on genetic mutations and signaling pathways altered in lung cancer have added significantly to our armamentarium for lung cancer treatment while minimizing drug toxicity. To date, four targeted therapies have been approved for treatment of lung cancer by the U.S. Food and Drug Administration (FDA): gefitinib in 2002, erlotinib in 2003, bevacizumab in 2006, and crizotinib in 2011. This chapter describes the basic molecular biology principles and selected molecular diagnostic techniques in lung cancer, focuses on the targeted therapies in lung cancer, the molecular biomarkers that identify patients likely to benefit from these targeted therapies, and the pathologic features correlated with molecular abnormalities in lung cancer. Lastly, new molecular abnormalities described in lung cancer that are predictive to novel promising targeted agents in various phases of clinical trials are discussed. Special emphasis is placed on summarizing evolving technologies useful in the diagnosis and characterization of lung cancer. 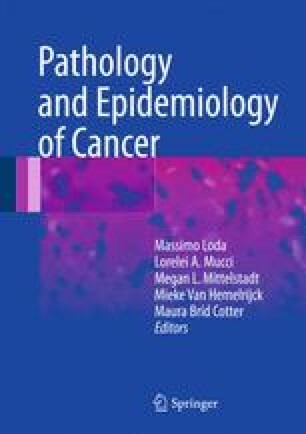 In conclusion, molecular testing of lung cancer expands the expertize of the pathologists, who will identify the tumor markers that are predictive of sensitivity or resistance to various targeted therapies and allow patients with cancer to be selected for highly effective and less-toxic therapies. Straif K, Cohen A, Samet J. IARC Scientific Publication No. 161: Air Pollution and Cancer 2015. Available from: http://www.iarc.fr/en/publications/books/sp161/Air%20Pollution%20and%20Cancer.epub.